Try to say that three times really fast! So, last week I took advantage of the Labor Day holiday, which meant my husband was home and could entertain Davey, in order to start work on Davey’s new big boy room. I’ve put it off a lot longer than I did with his first bedroom. I’ve toyed around with ideas on what would be best. Did I want to do a room devoted to Mickey Mouse or did I want to do one with a different Disney theme? Side note…anything Disney rocks this child’s world! Then I thought of practicality. 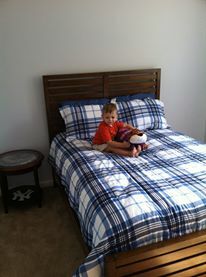 Did I want to redo a room again in a few years when he’d outgrown some of the kiddie/baby phase? Not really. I needed something easy, something convenient for me, and something that would grow with him. That being said, we quickly decided to avoid a themed bed (he has a racing car bed at his Grammy’s house in NY), just because I didn’t want to fork out the money again for another new bed in a few years. We landed on a contemporary, with a hint of the traditional, full size wooden bed. Bedding can always be changed. For a month the bed sat in our garage as the days ticked by as we awaited anxiously the ultrasound that would determine whether we were having a boy or a girl, hence dictating which room the bed would actually be placed. After a trip to Rochester to see family, and a quick jaunt to Myrtle Beach to kiss summer goodbye, we began work last week, and I must say so far I’m pleased. It’s a nervous arena, being the parent of a child who’s growing, one that you wish would stay your little baby forever. 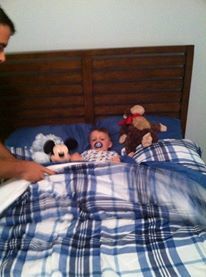 I cried when we converted Davey’s crib into a toddler bed! How the heck was I going to react to this? Truth be told, I was second guessing moving him into another room. First, the nursery is a tad bigger in size than his new bedroom. There’s more closet space, more playroom. Second, what if he became really irate about giving up his room? What if he didn’t want to move? Of course, this hasn’t been the problem and we haven’t even referred to the nursery as Henry’s room. Finally, with the walls painted, the bed up, and new bedding on top, we decided to let Davey have a “go” at the room on Saturday. Naptime is much more different. No longer do I rock him to sleep. Instead, I say “nap time” and he runs up the stairs (just like he always has) and I tuck him into his bed, give him a kiss, read a book, and then close the door. it takes about a half an hour to 45 minutes of him “talking” to himself or “reading” one of his books to his stuffed animals before he finally goes to sleep. Bed time is much the same, which has become quite shocking to both me and my husband. We both thought we’d have a bigger issue with getting him asleep in the big boy bed. From time to time, I see my little baby in his big bed and I do get a lump in my throat. I love the new stages and his growth and development, but I am super sad to know that one day he may be much too big for that bed.